This is an old recipe from my grandmother with a CF twist. 1. Heat oven to 350°F. Grease and flour 9-inch springform pan, or spray with baking spray with flour. 2. In medium bowl, mix flour, baking powder and salt. 3. In large bowl, mix granulated sugar and eggs with mixer on low speed until blended. Add olive oil, yogurt, ScandiShake and 1 tablespoon lemon peel; mix until blended. 4. Beat in flour mixture until smooth. Pour into pan. 5. Bake 30 to 35 minutes or until golden brown and toothpick inserted in center comes out clean. 6. Cool cake 15 minutes on cooling rack. 7. Remove side of pan. Carefully poke holes in top of cake with fork every inch. 8. In small bowl, mix lemon juice, olive oil and powdered sugar with whisk until blended. 9. 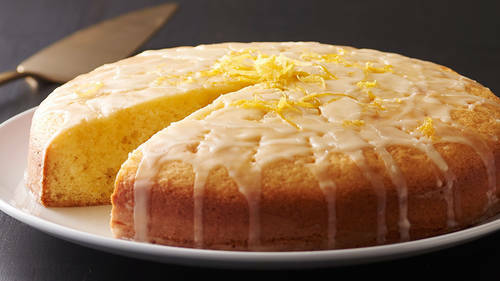 Drizzle cake with glaze. Written by: stylecomfy on May 14, 2017. This cake sounds absolutely delightful! I hate the ScandiShake alone, but this sounds like a great way to incorporate the extra calories into something delicious!